WSJ sources confirm that until recently Google has been creating an integrated messaging feature for Android, similar to what BBM, and, with iOS 5, iMessage have brought to the table. Android Market has a number of messaging applications that allow you to exchange files and media, video chat or call mobile and landline numbers, but besides Google Talk, which is somewhat limited compared to these 3rd party apps, there hasn't been a system-wide messaging system. Skype is pretty popular, but now that Microsoft acquired it, Google might be looking into taking its own offerings to the next level. There are a lot of tantrums thrown in these days how these smartphone platform messaging apps are going to kill one of the carriers' cash cows - text messaging, and it was not until Apple announced iMessage that everyone started pronouncing texting, BBM, and other means of communication dead. You still need the carriers to provide your data, though, and they can just raise the package price to compensate for all those things you will be doing via the Internet, plus it's premature to announce an extremely popular network like BBM dead, not to mention the mountains of feature phones that will keep on texting for a good while. Still, a systemwide messaging solution for Android that allows file and media exchange, plus text, voice and video group chat, would be a great addition to Ice Cream Sandwich, for instance. Combine it with Google Voice, and the challenge for carriers might be guaranteed this time. They might as well....I know they dont wanna feel left out. What's wrong with Google Talk? It's great! You can even chat from your phone to people's computers. Plus with Android 2.3.4 it has Google Video Chat built in. I video chat with my dad from my CM7 Evo while he is on his desktop PC. Nothings wrong with it...I just never used it or any apps like that on my phone. I barely use the camera. It seems IOS has solved the cross platform problem. 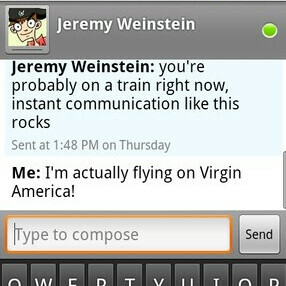 Or at least creates a seamless workaround...its built into the existing messages app. So u use the same app for SMS, mms, and imessage to communicate to everyone you know whether they have an idevice or not. And you don't even have to slide a switch or press a button, its automatic. So maybe not truly cross platform, it hides it well, but more versatile than BBM to be sure. My question is, instead of imessage, why wasn't ichat just incorporated? They could've given it the same functionality, but it would also be able to connect to Macs using ichat. At least this is what made sense to me. I'm actually flying with a Virgin from America! So what is Gtalk then? Isn't it available on BB, iPhone (unofficial), WeboS, and Nokia? Why not just oh um say...update it with some newer features such as file transfers? Invest in what you already have and make it better. Maybe they should change the name of Google voice to Talk and Talk to Chat or IM and just work with that. yeah I just don't get it... They have gtalk... most of my friends have a google account so it works for me. Even if they make a google messenger, it still will have to be connected to either your phone number or google account. Both duplicating functions most people already have and still limiting via cross-platform. GTalk already is pretty much available on everything... so whats the point really? They should just build in support for more im services. Personally I never got into the BBM... needed peoples id codes and junk, not cross platform... not worth it for me. Isn't it called google talk? Works cross platform, and well integrated in android phones. Okay, I understand wanting to make Google talk more robust...so just male Google Talk more robust. No need to develop an entirely new messaging app. you mean gtalk and imessage copying bbm right? You start looking pathetic, taco. It's not funny anymore. Forget about "copying" anything, take my advice, think of something new ("smart"). google should just purchase whatsapp for a few million, sorted. Isn't Liveprofile a true cross platform messenger you even get a BBM pin with it so people can talk with you on your Iphone and Android. Btw, just curious how many percentage of all phone user in the whole wide world use iMessege or BBM to replace thier sms service??? 0.01%? ?